Something I really hate to do is to waste food. One of the reasons I plan out a week of meals is that I can shop accordingly and only buy what I know I will use. But what about that leftover almond pulp? Despite my best efforts to use up the almond byproduct that results every time I make almond milk, it just doesn’t always happen. And raw almonds are so expensive that it actually pains me to throw the pulp in the trash. It’s perfectly good food, especially since the almonds were previously soaked, making them much more digestible and nutritious! So what do I do with it? Of course, there’s the obvious — add it to anyone’s smoothie or stir it into a warm porridge or muesli. And almond pulp freezes well, so I can save it for another time. But I am just way too lazy to get out my dehydrator and dry out the pulp to use as almond meal. And then I thought to myself, what if I just tried the almond pulp in a quick bread in place of some of the wheat flour? Well, guess what? It worked! Although apparently, a million other people already knew this and I am extremely late to the almond pulp party! I decided to take one of my banana bread recipes and tweak it a bit with almond pulp that was leftover from 1 cup of whole, soaked raw almonds. Remember, almonds have a lot more fat than grain flours, so we can cut back on some of the added fat. But almonds have no gluten, so I was reluctant to make an all-almond pulp bread this first time. I know this will be neither Paleo nor gluten-free (although I am confident you can swap the gluten flour for a good GF all purpose mix + a little xanthan gum), but I think we can fix that with a few more tweaks. Using half whole wheat flour and half almond pulp, this bread came out to be ABSOLUTELY PERFECT! Moist but hearty, not crumbly, and not too sweet. 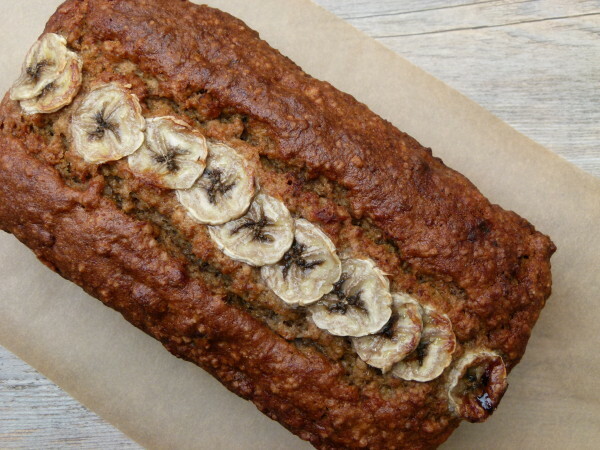 It’s perfect banana bread, in my book. My life changed instantly!! Let’s all imagine the possibilities of subbing some almond pulp for flour in different recipes! Is this exciting or what?? Most of the recipes on my site have been made in my cooking classes and at home about 20 times, but this one I just did once so I haven’t tested all the permutations, e.g. all almond pulp, no bananas, butter for coconut oil, and so on. But you can bet I will! I am planning on making my Millet Blondies today with almond pulp. Check my Instagram for updates! And please share your experiences with subbing in almond pulp in any recipes — I’ll try anything! Preheat oven to 375 degrees. Grease the bottom and sides of a 8 ½ x 4 ½ loaf pan with butter or coconut oil and line with unbleached parchment paper, if desired. In a large bowl whisk together the flour, baking soda, baking powder and salt. Set aside. 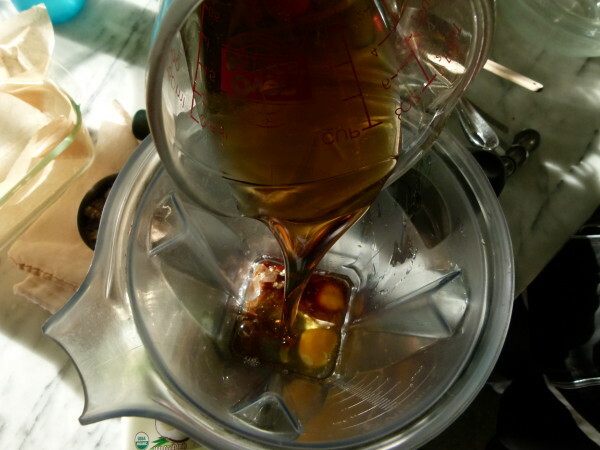 Place the almond pulp, maple syrup, melted butter or coconut oil, eggs and vanilla in a blender and process until combined. Or whisk well in a medium bowl. Amazingly good! Just made today and used hazelnut pulp. Thank you so much for this recipe! It passed my husbands taste test. Oh wow – hazelnut pulp! I bet that was delicious. I need to try that next! I did make this with blanched almond flour because I didn’t have any pulp handy. I just added one extra tbsp of coconut oil like you suggested in an earlier comment, and it turned out delicious! THANK YOU! Yay! So excited to hear that! I never comment on blogs… but this recipe is absolutely perfect. 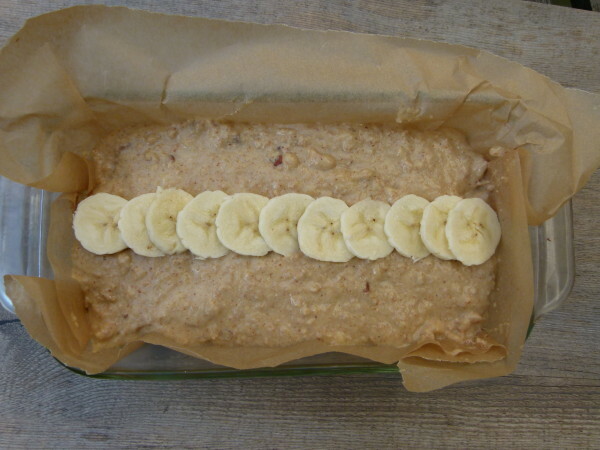 It will be my go to banana bread recipe now… and I’ve got about 6 cups of frozen almond pulp to use up! Thank you for the exact recipe that I needed!! 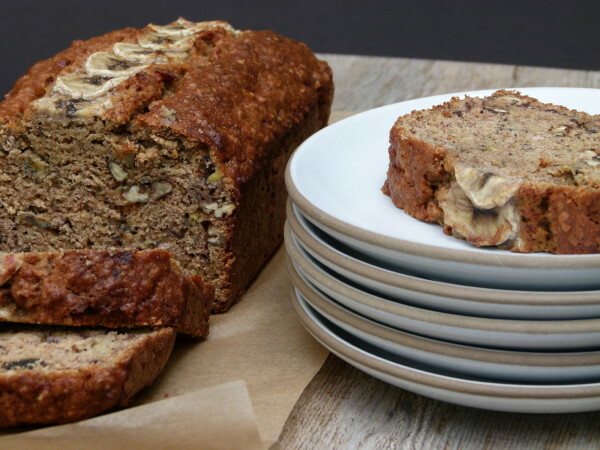 Have you ever used Teff flour when baking? Or cooking? Just discovering it but not sure when to use. Also, can this recipe work as muffins as well? This recipe can work as muffins, just cut the cook time. I would test them after 20-25 minutes. I have tried teff flour, although I haven’t used it in a while. I find that it is much better when it is combined with other flours, like whole wheat pastry. My almond “pulp” has been sitting in the fridge for about a week. Will it still work for this recipe? Yes. I’ve used one week-old almond pulp. hi this looks like a great recipe. I’ve just started making almond milk and don’t want to waste the pulp. Quick question: my husband is allergic to bananas. I know that’s what is distinct about the bread, but any suggestions for a substitute ? Since I am from Europe, I converted the cups to grams and it worked out fine. The only changes I made were 3 large bananas instead of 2 and approximately 50% more of the almond pulp (I guess 1 and 1/2 cups) because this was what I had left from 1 liter of homemade almond milk. First I was afraid the bread would not turn out well, but it was luscious and it had such a great, intense banana taste. Thank you for this great recipe. Can you please provide the version of the recipe by weight, especially for the flour part? So sorry, I don’t have those measurements. Next time I make it, I will weigh everything. 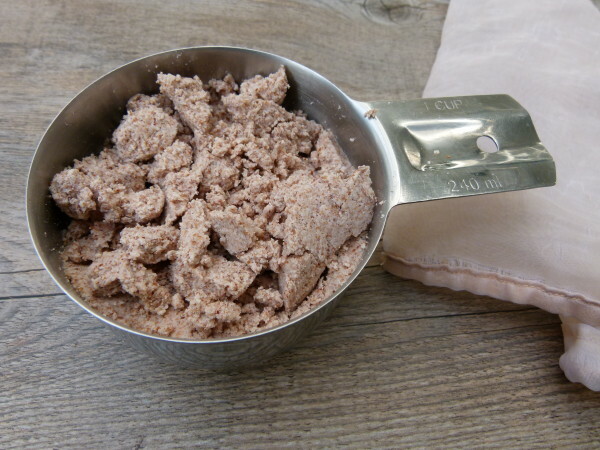 Could I use almond meal instead of almond pulp or do you think it would change the texture since there is no water in the almond meal? Thanks! Not sure. I formulated the recipe to account for the extra moisture in the pulp. 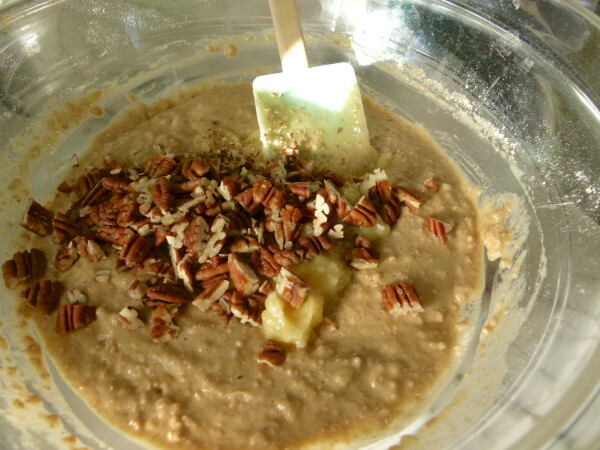 If you try it with almond meal or flour, maybe add an extra bit of fat. Hi, Pamela. Could I substitute white whole wheat flour for the whole wheat pastry flour? 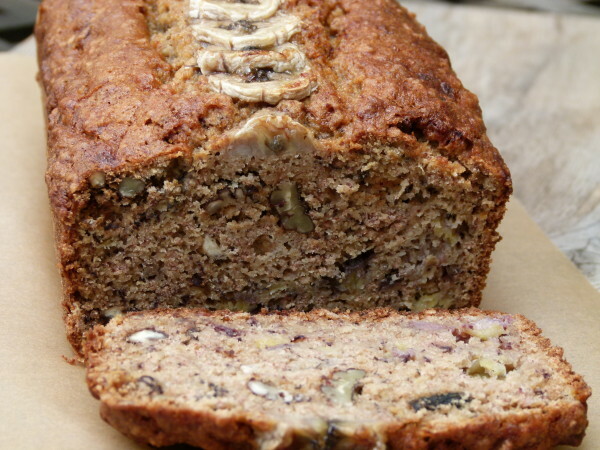 This is a great recipe and results in a really moist bread. Could I use coconut sugar instead of maple syrup? If so, how much should I use and would I need to adjust any of the other ingredients? This bread has become a staple in our house. 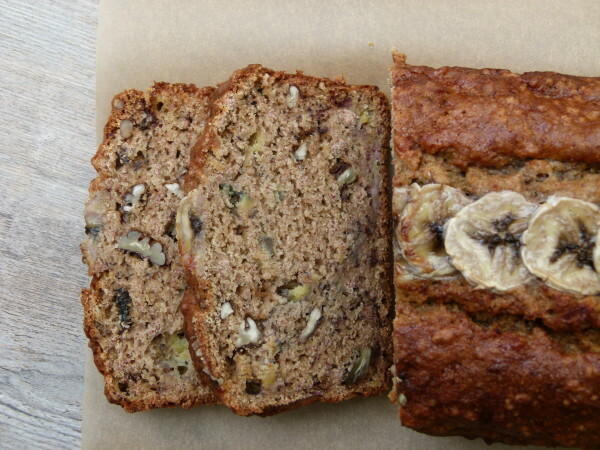 We make almond milk twice a week so of course, we get banana bread every week! Thanks for such a great tasting (guilt free) recipe! Hi, can u tell me how many calories are in a serving of this cake? Many thank. Just made with my leftover almond pulp and its delicious!! Yesterday, I made your multigrain waffle recipe. I didn’t have buttermilk so I subbed in plain Kefir and they were yummy! Thanks! How great! Yes, kefir for buttermilk works perfectly. Thanks for the comment, Kathleen! Yay! Thank you! More almond pulp recipes to come! Thank you, Jen. SO kind of you! Could I make this vegan and gluten free? Just wondering how critical the xanthan gum is. I’m thinking you now are a fan of jovial gf and maybe TJs gf flours? It’s what gives the batter structure. You can try making this without, but I think it will be dense and wet. I love Jovial GF flour as well as King Arthur multipurpose GF flour. Check Jovial Foods website for their GF recipes. Jovial flour already contains xanthin gum FYI. The muffins (w/flax eggs) came out great! We are enjoying them for breakfast this week. Awesome! I felt pretty confident the flax eggs would work out well, but I’m glad to know for sure. Thanks for reporting back!